Read original articles written by MANY's staff about Resources, Community, and Exhibits/Collections. Check out the Letters From Erika to learn about what is going on here at MANY! When the Cooper Hewitt Museum reinstalled their galleries in 2014, their priority was to provide access to their physical and digital collections, which number more than 200,000 objects. Allowing visitors to interpret an exhibition in their own ways creates a unique and personal experience for every individual. Letting visitors engage with an exhibition and understand the collection on their own terms can offer much more meaningful museum experiences. But how could a museum allow visitors to navigate and engage with exhibits and their digital collection at the same time? The Cooper Hewitt invented the Pen and Interactive Tables as tools to help visitors navigate the museum and learn about the collections. With the Pen, visitors can “collect” and save objects they find in exhibitions and then revisit those saved or “collected” objects when they return home using a code on their museum ticket. The Cooper Hewitt also wanted to increase public access to the collection. At the Interactive Tables found throughout the museum, a river of objects floats in the center. Using the Pen or a finger tip, objects can be dragged to a home base and the display expanded for more information. Visitors can recall items saved on the Pen to the Interactive Table to learn and play with color and pattern with “design it” elements built into the table. Visitors can use the Pen tip to draw on the interactive tables and then save those designs. This technology empowers the visitor to interpret the collection and exhibitions on their own terms and curate their own experiences. It is a great tool for tourists, or first time visitors to explore the scope of the collection and to save and share what they liked. Yet, it is also a resource for researchers and designers to return to over and over again and have a different interaction each time. During my visit to Cooper Hewitt, I spoke with Adam Quinn, Digital Product Manager, who shared the history of this technology as well as its the future. “A lot of your experience in the museum revolves around the Pen,” Adam told me. It’s been four years since the Pen debuted, so what’s next for digital engagement at Cooper Hewitt? Adam said that the museum team is always looking at what they’re going to do next, what the ideal visitor interaction should be and learning what people love about the museum now. The Pen is iconic to the Cooper Hewitt, but what else can or should the museum do to further enhance a visitor’s experience during and after their visit? Opened in 2014, the Immersion Room is a major feature of this interactive and immersive use of its collections, in this case of digitized images of wallpapers, originally collected by the Hewitt sisters, and is one of the most exciting spaces in the museum. In the Immersion Room, visitors can view the digital wallpaper collection using an Interactive Table highlighting wallpaper patterns. Adam described that using the Interactive Table and Pen in the Immersion Room lets you not only explore the wallpaper collection, but manipulate digitized images and become a wallpaper designer in your own way. It is a completely interactive space and with the large projections on two of the walls, you can transport yourself into the design. “The room is designed to reach a wide audience and allow interactions that are interesting to a lot of different people for a lot of different reasons,” Adam said. The technology appeals to multiple targeted audiences -- tourists and first time visitors, museum members who are designers, and kids. The Immersion Room’s intuitive interface appeals to multiple audiences and allows visitors to go as deep into the collection or design learning and experimentation as desired. That can mean just drawing a wallpaper design, seeing it projected onto the walls, taking a picture with your cell phone, or a designer using the room to explore the collection for research and inspiration. Moreover, beyond the specialized experience that the Pen and the Immersion Room can offer to visitors, the digital image technology also creates an organic promotion for the museum. The Pen is designed to allow visitors to save their favorite collection items, “bring” them home with them, and share their museum experience. They can also share with their friends or the world, via social media. Scrolling through the #immersionroom on Instagram, or visiting the tagged photos on the Cooper Hewitt’s Instagram page, there are hundreds of visitor self photos engaging with their wall paper designs that generate a lot of engagement in likes and comments. Cooper Hewitt isn’t fearful that by making their digital collection accessible that they are losing control of their content or even a possible revenue source. Their priority is making their collection as accessible as possible. The final phase of a visitor’s experience at Cooper Hewitt is after they’ve left the museum. Cooper Hewitt calls this the “post-visit experience.” By prioritizing access to the collection, Cooper Hewitt lets visitors relive their museum visit long after they’ve left. This unique and personal approach to exhibition interpretation creates a connect between the museum and its visitors and allows the visitors to shape their museum experience. On January 31, I joined a DHPSNY webinar about deaccessioning led by Dyani Feige, Director of Preservation Services for the Conservation Center for Art & Historic Artifacts during which she said that “Deaccessioning is part of being a good collections steward.” Deaccessioning can be a helpful resource to manage an overwhelming or irrelevant collection if done correctly. Deaccessioning is the permanent removal of previously accessioned materials from an institution’s collections. Unaccessioned materials, like undocumented items, long-forgotten loans, and “doorstep donations” are all property that because of its undocumented status can strain an institution. New York’s Museum Property Law created a mechanism that allowed museums resolve old loans and ownership of undocumented property like unreturnable loans and undocumented property, meaning property that the museum is not able to determine the lender, donor, owner, or deemed as “found in collections” to make a legal claim for ownership. The law allows institutions to properly deaccession those items. The law also prohibits museums from using the proceeds from deaccessioning for anything other than acquisition, preservation, and care of collections. There are a number of reasons why an institution might turn to the deaccessioning process. Although the process can differ from institution to institution, it can be a tool when a new collection policy is implemented, or a systematic evaluation conducted to determine what is appropriate for a collection or a re-evaluation of the collection storage space. An institution might make the decision if it is in the process of becoming more professional in their collections stewardship or hiring a collection manager or archivist with an information science background. When a museum is in a transition or it is clarifying and and consolidating its collections scope, it might choose to deaccession objects its collection. An institution needs to have a strong policy and guiding framework to follow New York State laws and deaccessioning process best practices. It is important to share the collections policy and interpretation strategy publicly going forward and provide strong reasonings as to why collection items are being deaccessioned. It is also an opportunity to engage with the public and provide education about good collections stewardship and field questions and concerns. Institutions can also look to “good neighbor deaccessioning.” Good neighbor deaccessioning is where one institution can look to others to see if any objects would bolster the mission of a cultural organization in a same town, county, or region. Perhaps that neighboring institution has better resources, or a potentially deaccessioned object is more relevant to their interpretation strategy. It could be as simple as items that are part of a set going to another institution. This form of deaccessioning creates good will among any community concerns while also contributing and strengthening another organization’s mission. It’s not always a clear option, but it is a great one to start with when thinking about deaccessioning. The success of a museum may rely on how it develops relevant content that appeals to visitors, members, and donors. Its collections are the museum’s most valuable resource when shaping mission, creating programs for visitors, and developing earned income opportunities through merchandising and licensing. However, museums might have accessioned objects that cannot be given proper care, are duplicates, do not fit collecting scopes, or are part of a set owned by another institution. All are practical reasons to look at deaccessioning. Institutions that choose to deaccession collection items should review their policies, but also have a clear communication plan to maintain public trust and remain transparent by publicly stating what is being deaccessioned, the reasons why, and where the proceeds from the sale are designated. Deaccessioning can be a helpful resource to manage an overwhelming or irrelevant collection. Having important objects in your collection is great, but the ability to develop content turns a collections into a valuable, relevant resource. I am writing from AAM’s Museum Advocacy Day where 300 museum professionals will be speaking up for museums on Capitol Hill — 26 are from 18 of New York’s Congressional Districts comprising the largest delegation represented. New York State Congressional Representatives are critically important to federal funding for museums. The new Chair of the House Appropriations Committee is Congresswoman Nita Lowey (D-NY17). Senator Gillibrand (D-NY) is the author of the IMLS re-appropriation letter in the Senate and Congressman Paul Tonko (D-NY20) is one of the bill sponsors in the House. Although I wrote about this January, not everyone saw the letter, so I want to be sure to bring everyone up to speed about what happened with the Museum Education Act (MEA).The MEA would have created a grant program within the New York State Education Department that could have funded things like school groups and school buses, publishing curriculum on websites, teaching classes to adult learners, and creating exhibitions that align to New York State education standards in museums located in high need, low resourced communities. MANY board and staff, legislators, Member of the Board of Regents, New York State Education Department Commissioners and staff, Museum professionals and supporters, worked for more than a dozen years, and we took it to farthest possible point in the legislature. It passed both houses unanimously - which I have since learned is not a common occurrence. The MEA was vetoed by the Governor with a note about how the bill would duplicate funding in already in the NYSCA budget. Disappointed? Yes, Discouraged? No. Because whether we can speak out in Washington or in Albany, we do know how important our field is to education, to tourism, and to our community as we are the anchor institutions who tell the stories of art, history and culture in, for, and with our communities. The more MANY has grown over the past couple of years (on February 22 we had 646 active members) the more I learned that as an organization of our size and scope, it is important for us to build an advocacy platform upon which all museums, regardless of their location, budget size, or discipline can stand on together. It is important that MANY moves forward in ways that include as many of of members as possible and help them serve as many of their constituents as possible. You can join us as we advocate for museums in Albany March 11 and 12 at Tourism Action Day and or if you can’t make it to Albany, please let us know how you are speaking out for your museum. 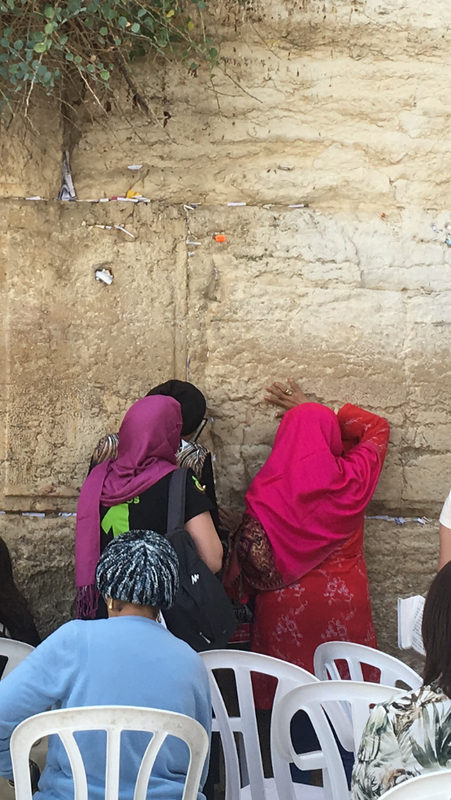 Shortly after my grandmother passed away, I found myself in the Old City of Jerusalem, leaving a note to her in a crevice of the Western Wall. I was there with a group of academics who had convened in Israel for the International Council of Memorial Museums conference. I’m not a religious person and neither was my grandmother but standing at the base of this ancient and venerated wall made me think about her, and about the profound impact of the past on the present. I wanted my message to her to join the countless other prayers, letters, and wishes in the Wall, to become part of an intricate but interconnected road map made up of traces of human experiences on the surface of stones that spanned empires. The gesture was one small way to honor her existence and our bond. After all, you remember life with life, as American scholar and Judaist, Dr. James E. Young had remarked in his keynote address just days earlier. As a curator at the 9/11 Memorial & Museum, I am uniquely exposed to how people choose to honor the departed at a public site of tragedy and remembrance. These gestures continue to move, inspire, and surprise me with their creativity, even as the distance between 2001 and the present deepens. 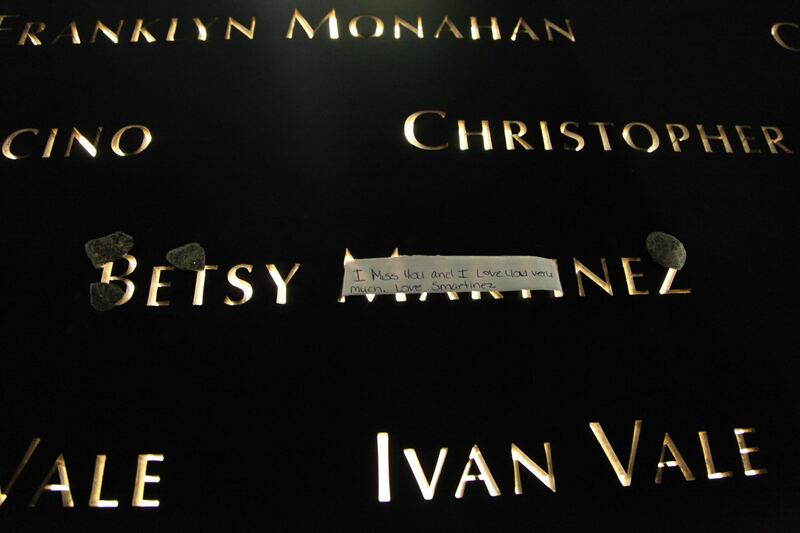 From launching charities in honor of their loved ones, to leaving notes tucked into a name – one of nearly three thousand incised on the parapets surrounding the 9/11 Memorial’s twin reflecting pools - the forms in which people remember and commune with the deceased feels as boundless as the historical continuum itself. Some of these memorialization efforts are strikingly familiar, while others are more specific to circumstances framing 9/11. Some might come to re-define the course of a person’s life, while others are quieter gestures woven into a private moment on a seemingly random day. Additional ones, however, come to the Museum as a carefully chosen physical object, photograph, or spoken remembrance gifted on behalf of a victim. 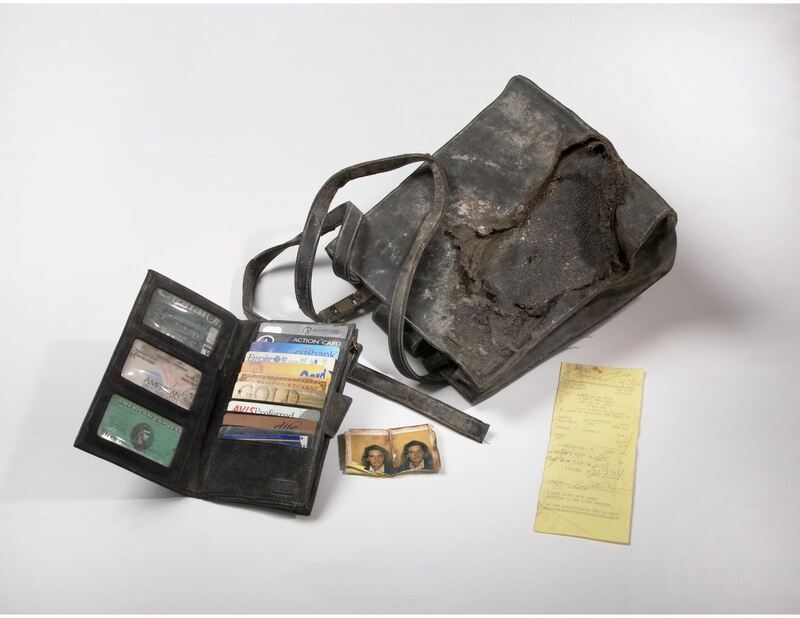 Early in my tenure at the Museum - nearly six years prior to its 2014 opening, when we only had sketch renderings of what the anticipated exhibition spaces might resemble - I was particularly struck by the donation of a pocketbook and its contents, that had been recovered at Ground Zero. The items belonged to a 37-year-old bond trader who had treated her mother and others to a birthday celebration at Windows on the World the night before. The receipt from the occasion at this renowned restaurant – located on the 107th floor of the Trade Center’s North Tower - was among the recovered pocketbook contents donated to the Museum by her mother and brother. The items were part of the inaugural display of personal effects tied to victims in the Museum’s exhibition, In Memoriam. Everyday objects, like these, which managed to dodge destruction characterize a significant part of the 9/11 Museum’s permanent collection. Paired with stories about the individuals to whom these items belonged – contributed by those who knew and loved them - can imbue these artifacts with a very humanizing energy that undercuts the abstraction of mass tragedy. These memorial artifacts do not always bear the patina of Ground Zero, however. Sometimes, the object’s potency lies in the fact that it was left at home, or by the bedside of its owner on the morning of 9/11 and presumably could have been one of the last things they touched. Other times, it can illuminate a specific aspect of a life lived in the form of a pair of leopard print-patterned clip-on earrings that were worn by a Brooklyn-born, Staten Island-dwelling 62-year-old mother of three; an Argentina national soccer team jersey worn by a passionate fan – a young Argentinian-born firefighter killed in the line of duty; or a poetry and song-lyric journal filled with the gorgeous Bengali script of a 26-year-old woman who worked with her husband at Marsh & McLennan – both of whom perished that day. These glimpses into the lives of people killed on 9/11 are shared with us through the offerings of the living who have chosen to nurture their loved ones’ memory at a public site of remembrance. This affirmation of our shared humanity and the transcendent sorrow of loss contribute to the resonance of such sites of collective pilgrimage, enabling them to communicate with generations across time and cultures. I initially came to the Western Wall without the intent of leaving anything behind. However, the sight of people congregated at its ancient base, drawn there from all over the world to perform their rituals – religious or otherwise – moved me to perform one of my own and leave a piece of my story – my grandmother’s story – within the historical continuum. Dwarfed by the incredible scale of only a segment of the retaining wall that once protected the Temple Mount, the notes that fill its crevices, touched and finessed into place by the hands of many, seem delicate and ineffably human in juxtaposition with the towering and formidable limestone. The act of leaving one behind was as deeply personal to me as it was a shared experience with everyone there on that October day. The timeless and cross-cultural nature of remembrance rituals is something that I hope people find moving when they visit the 9/11 Memorial Museum and other sites of mass trauma and violence, as a testament to the irreplaceable value of each and every human life. Perhaps they might be moved to leave their own tribute behind or find an unexpected connection to an everyday item like a young woman’s pocketbook. Alexandra Drakakis is the Associate Curator at the National 9/11 Memorial & Museum and a MANY Board Member. Exhibitions have no limits when they’re created in virtual reality. That’s what more and more museums are happily learning as VR pushes the visitor experience into a whole new realm. As immersive exhibitions stretch beyond physical walls, VR allows new, exciting ways for museums to connect and build relationships with visitors. With VR, visitors can interact with people, artifacts, plants, animals, even distant planets, in an environment that transcends time and space. It also engages younger generations through the use of breakthrough technology and helps position museums as fun, rewarding destinations. As creative minds are challenged to offer better, more exciting experiential exhibits, museums are also finding that development costs for VR can be rough on the budget. This is one reason that MANY members EXPLUS, Inc. and Frameless Technologies combined decades of museum exhibition development experience with cutting-edge technology to create The Way Box – a VR exhibition tool that provides museums an economical way to feature new VR exhibits on a regular basis. The Way Box is delivered built-out and ready to for visitors to experience the exhibition in virtual reality. It can be installed in museum of all sizes, with configuration options that range from 4 to 24 seats. Each visitor enters The Way Box and has their own VR station, equipped with a headset, interactive features (such as hand gesture hardware) and atmospheric enhancers (such as heat, cold, wind, etc.). The visitor then enjoys a personal, interactive, 5-7-minute VR experience. The Way Box also offers a subscription model for museums sharing a common focus (science, history, aviation, etc.). These themed subscriptions provide fresh, immersive VR exhibits where the content and technology are replaced/updated on an annual basis. The Way Box custom model allows for the development of unique VR experiences for specific museums that can be featured long term and replaced/updated as desired. I am a non-traditional museum person. I didn’t get a degree in museum studies but I learned first hand. During graduate school, I started my museum career at a cemetery museum. The experience was peculiar, intriguing, and rewarding. This working cemetery museum disrupted my own fixed impression of what a museum was and introduced me to the idea that a museum is a place for ideas and discussions. I learned about museum best practices from my colleagues, engaged in Twitter discussions about trending museum topics, and I joined the local museum association to connect with museum professionals and emerging museum professionals that gave me insight into the museum field. Participating in a digital space allowed me access to continuous discussion forums, hashtag conversations, and global museum resources. Having a traditional museum background did not matter. There was a wide support group available to me online. However, even with this vast digital world at my fingertips, it was easy to feel disconnected. I wasn’t sure how to take grand concepts and ideas from larger institutions and make them applicable to my museum or to my own professional development. Individuals and small museums can feel disconnected from the larger museum world. Digital platforms can be a remarkable resource to crowdsource problems in search of sustainable solutions. In-person discussions, however, can lead to meaningful connections and deeper resources for an individual to grow professionally or to help museums connect with one another. I joined the Museum Association of New York as an individual member in 2015. My first MANY meet up at the Chemung County Historical Society allowed me to meet my online museum peers and have an engaging conversation face to face. Exchanging contact information beyond a Twitter handle provided the next step for future collaborations and to discuss ideas. The first MANY annual conference I attended put the top museum professionals and my museum peers in one space sharing compelling and eye-opening topics. I could shake hands and put a face to a name. Since joining MANY as the Marketing & Social Media Coordinator in December 2018, communicating and engaging with museums across New York State on a digital platform has been my focus. These online platforms allow for continued conversations and sharing ideas between in-person meetups, which culminates at the annual conference. The conference provides opportunities to meet with your peers in a professional and casual setting. These face to face conversations that happen at the annual conference establish invaluable connections for future partnerships. As a non-traditional museum person, digital platforms have been a great substitute to connect with museum professionals and gain information about museum best practices. However, the opportunity to hear and connect with over one hundred presenters from over eighty institutions in one place on a variety of topics for fundraising, education, collections, and discussions on diversity, equity, accessibility, and inclusion is something that cannot happen on a screen. My museum career has been nontraditional, but nonetheless ardent. I learned best practices from my colleagues, first-hand experiences, and from MANY member resources. The resources that MANY provides, like the annual conference, allow museum professionals to learn from each other, share insights about projects, and discuss compelling and eye-opening topics happening in the museum world. I look forward to attending the conference in Cooperstown this Apil and to join a broadening conversation about what access and identity mean for museums in 2019. Topics like instilling diversity, equity, and inclusion into museum administration and front of house operations like programming and exhibitions. Moreover where else can you hear from AAM President & CEO Laura Lott discussing the important call in leadership for diversity, equity, accessibility, and inclusion in museums. Or from Tenement Museum President Kevin Jennings dissect how the stories we tell reflect what lives we value. Both keynotes providing a starting point for ongoing thought to carry throughout the conference and well beyond. The annual conference will renew and stimulate your excitement about what is happening in the museum field. Join us at the MANY annual conference and invest in your professional development. Meet with your online peers in person and connect beyond the internet. When we launched our new website a year ago, we had administrative goals for MANY like improving financial management and streamlining membership renewal. Being a bit of a techno geek about human/computer interface design, I was also interested in how the website could help build a community. I wanted to build a website that was responsive and dialogic, that could move valuable information easily from passive to interactive, and help MANY equalize member access and sharing no matter their location, budget size, or discipline. In this profession, we are connected by our cultures, our natural and built environment, and the history of our use of the land, water, and sky. We are also separated by distance. MANY's website is a way to ameliorate that isolated feeling we sometimes get from being stuck at our desks as the snow flies. On January 2 we launched our new job board with the goal of making it much easier (and free!) for MANY members to post position openings and for job seekers to find them. Our member discussion forum is the ideal place to post opportunities like the N-YHS poster exhibition. Or the member news forum update from the Erie Canalway National Heritage Corridor about the progress on the Matton Shipyard. Are you doing an event this spring that you are proud of and would like your colleagues to know about? Share it on our event forum. Not a member? Join today and join the conversation. If this way of communicating interests you, but it seems like a bit of a challenge to figure out how to make it happen, we will be hosting website "how-to" sessions for our members in February and March. Watch for emails and sign up. Our new high speed WiFi connection will make it easier than ever. Although we would love to see everyone at our annual conference, or at programs like The Museum Institute at Great Sagamore, we know that some years it just isn't possible to get us all in the same place. So please post exciting news, events, and opportunities, reach out to colleagues, and contribute to our website forums. And if you haven't checked out all the great things happening on our social media feeds lately, take a minute, click on over and share something good! Troy, NY — The Museum Association of New York (MANY) has awarded Dyckman Farmhouse Museum Executive Director Meredith Horsford its inaugural Cassetti Annual Conference Scholarship. The Scholarship Committee had many exceptional nominees from across New York State to consider, but Meredith’s nomination quickly rose to the top in the selection process. The scholarship was created to recognize Robert K. Cassetti’s, Senior Director of Creative Strategy and Visitor Engagement at the Corning Museum of Glass and former Museum Association of New York Board President, significant contribution to the advancement of New York’s museum field. This is MANY’s first, full scholarship for a museum professional to attend the annual conference. The scholarship includes conference registration, two nights in the conference hotel, and a $150.00 travel stipend. According to the American Alliance of Museums, museums contribute $50 billion to the national economy. New York ranks as the second highest contributor, generating $5.4 billion annually1. That is nearly half of the $108.7 billion total tourism dollars generated in New York in 20172. Museums clearly are an important economic force in New York, but the numbers also indicate that there is also quite a bit of room for museums to grow within the tourism industry. Attracting more recreational tourists to museums is not a new idea, but the need to pay more attention to trends in this sector was reinforced this past September when I was invited to attend the NYS Bicycling Summit in Saratoga Springs. Organized by the New York State Bicycling Coalition, the Summit focused on a variety of topics related to bicycle safety and increasing interest in bicycling for recreation and transportation. Did you know that cycling tourism is the largest sector of the growing tourism economy? The Outdoor Industry Association completed a national study in 2017 that found that bicycling participants spend $83 billion on 'trip-related' sales, and generate $97 billion in retail spending3. In 2012, Parks and Trails New York released a study that found that the 277 mile long Erie Canalway Trail alone generated $253 million in sales, created 3,440 jobs, and generated 1.6 million annual visits4. Despite working at a museum located near numerous established bike paths, I was unaware that cycle tourism had become so popular! Museums and historic sites were mentioned repeatedly throughout the Bicycling Summit and I learned quite a bit about the mutual interests of cycling advocates and museums. Currently, New York State is actively expanding bike paths across the state and improving cycling safety as a part of its ongoing effort to increase tourism state-wide. 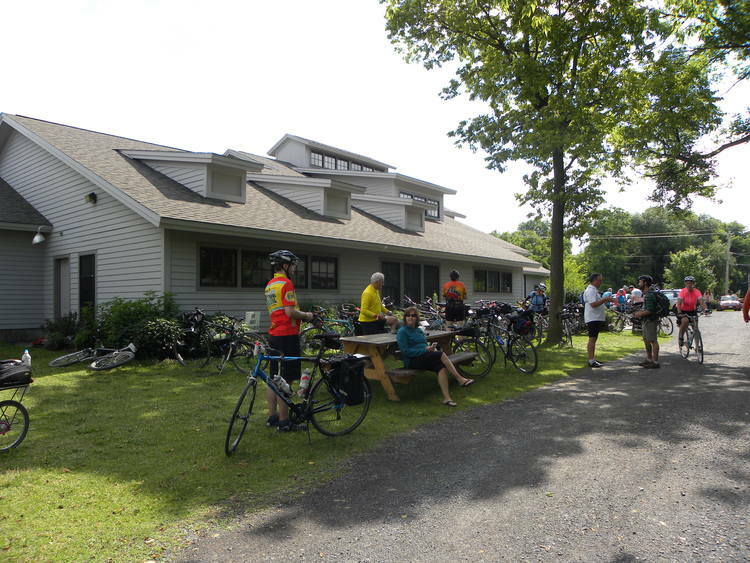 Museums in the rural and scenic areas of upstate New York are especially poised to serve cycle tourists who increasingly express interest in exploring small towns within two to five miles of their route. They are seeking opportunities to experience a “strong sense of place” (a phrase that was frequently repeated during the Summit) and they spend more time in a single community than automobile tourists. It is important to be aware that cycle tourists have needs that differ from those of tourists who are traveling by car. As you can imagine, they need rest stops along their chosen route that provide for their basic needs such as a place to lock bikes and rest briefly. Cycle tourists also want to learn a bit about local culture and history and they are looking for interesting and entertaining diversions as they pass through each community. If your museum is located within five miles of an established bike path, pay attention to cycle tourism trends consider offering services tailored to the needs of cycle tourists. There is no single source of information about all bike paths in New York but the NYS Bicycling Coalition Provides regional resource information here. Provide a covered place to safely lock bikes during their visit. It may also be a good idea to keep a list of bicycle repair shops in your area for visitor use. Provide a bathroom facility and a safe, comfortable place to sit down and rest. Makes sure that your museum has an attractive and welcoming gift shop offering easily portable, locally produced items that reflect the unique character of your community. Ideally the shop will also carry items of use to cycle tourists such as flat repair kits and water bottles. Provide access to snacks such as bottled water and granola bars. Team up with a local restaurant for cross promotion of services if you can’t provide food on-site. Keep your tours and programs brief and engaging. Most cycle tourists will spend an hour or less at each rest stop. During the Bicycling Summit there were many stories about overzealous tour guides taking up too much time and offering too much information. This is such a common experience that it seems to be an insider joke among the cycling community! Train volunteers to offer a few engaging stories instead of attempting to provide a full encyclopedia of information. Check to see when bicycle tour groups will be moving through your area and adjust your operating hours to accommodate them. Far too many cycle tourists find that museums are closed when they wish to visit. In fact, summit participants repeatedly expressed frustration with attempting to access museums outside of 9-5 business hours. Meet with cycling groups to discuss cross promotion and other joint marketing strategies. You can find information about who is cycling through your area via the Ride with GPS website. Ride with GPS also provides ways to promote visitation to your museum through designated ambassadors, cycling route maps and other services. Cyclists may not have regular access to the internet so, provide marketing resources in the form of printed rack cards, brochures, and pocket maps that are easy to carry. Work locally to improve safety for cycle tourists. There were many concerns expressed about cycling through industrial districts and past numerous abandoned buildings in towns along the Mohawk River Valley, Hudson River Valley and other areas. Cycle tourists are especially concerned about personal safety. Provide maps and directions to assist them. If your museum works with developers to reduce adverse impacts for new construction within historic districts, advocate for bike path linkages to the historic district and/or your museum. Attend conferences related to recreational tourism. Pay attention to annual tourism studies released by New York and reach out to colleagues in other sectors of the tourism economy. With some thoughtful consideration of the needs of cycle tourists, even the smallest museums can benefit from this new and growing trend in tourism. During the Summit, I quickly discovered that bicycling advocates are eager to share information and to partner with museums to improve the experiences of cycle tourists. Let’s reach out and start talking about ways to support each other! If I am lucky along my travels, I can stop to visit a museum, meet an industry partner, or walk in one of our beautiful state parks. I wish I could accept every invitation extended along the journey, but my plans are frequently diverted before I can measure the miles to home. Last week time was on my side and I got to see the new Kids Rockwell Art Lab, across from a pizza place and three doors down from the ice cream store on Market Street in Corning. The Rockwell Museum began thinking about the Art Lab as a way to continue to serve family audiences during a construction project to replace the second and third-floor gallery windows that required the removal of collections and the closure of the family engagement studio. A Market Street double storefront space was available and a satellite museum space was born. The Kid’s Rockwell Art Lab opened in mid-September on the day of Corning’s Harvest Festival. Three hundred people attended and great press coverage followed. Brian Whisenhunt, the Rockwell Museum’s Executive Director said that he knew that the Art Lab was a success when a toddler had a “melt-down” when told it was time to leave—an achievement indicator familiar to children’s museums and science center staff. Although the Art Lab represents a major new investment, the need for space during construction was real and the museum’s commitment to serving its family audiences is strong. With few low-cost, indoor winter activities available to families in the region, the Art Lab will be a creative option on a snowy day. Adult admission fees cover both the Art Lab and the Rockwell Museum and admission is free to kids 17 and under. As many local private foundation funds were committed when the need for space became apparent, and capital support was dedicated to the window replacement project, the Rockwell was challenged to secure enough financial support before they could open Art Lab’s doors. With creative re-use and a small budget, the Rockwell filled the space with activities from the museum’s family engagement studio, borrowed furniture, and recycled the admissions desk from a recently-closed department store. Along with the addition of two staff to the Visitor Services department, the biggest investments were associated with getting the Art Lab up to current building codes with the addition of bathrooms, wheel-chair accessibility, and a new coat of bright paint. Future plans for The Kid’s Rockwell Art Lab include developing partnerships with teachers and high school students, changing activities three times a year to coincide with exhibitions on view at the Rockwell Museum, and hosting the traveling exhibition “Framed: Step into Art” from the Minnesota Children’s Museum in next summer when Corning will be filled with families visiting from out of town. I traveled thousands of miles and met hundreds of people in the past two months, all passionate about their work and committed to making their organizations relevant and sustainable. When funding is hard to find and space is limited by a construction project museums may choose to put a well-attended program on hiatus. The Kids Rockwell Art Lab is an excellent example of how engaging community, stretching resources, and applying creativity can help a museum reach a new level of success. My journeys this fall have been just as valuable as the destinations. Thank you for making me feel welcome at every place I have landed. I will be at the MuseumNext “Designing the Future of Museums” conference this week and will report back soon about lessons learned. We have two more workshops, and two more Meet-Ups ahead of us in November. I hope to see you along the way in either Utica or on Long Island!